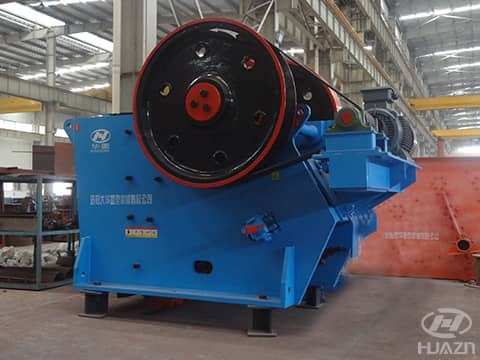 Home > News > Product Knowledge > How to Operate the Jaw Crusher? 1) Check-up the lubrication of bearing, toggle plate and movable jaw, check the contact situation of toggle plate’s gasket, and check if there is enough lube between toggle plate and toggle plate gasket. 2) Adjust all fasteners firmly. 3) Check if flywheel and groove pulley's center position are right. The center of flywheel shaft is on same line (180 degrees) with pulley's shaft center. 4) Check if the transmission belt is installed right, if there is some attrition, change it in time. Clean the belt and wheel if they are dirty. 5) Check if safety device is ok or not, if there is any insecurity; clear it as soon as possible. 6) Ensure crusher chamber hasn't any material and other things. 7) Ensure the shims are installed rightly and compactly. (3) Stop the machine if it’s abnormal. After identifying the problem, you can start-up the crusher.